Avalon has created stress relief in a collection of unique townhomes built under the ZEN brand in Chinook Gate, Airdrie. 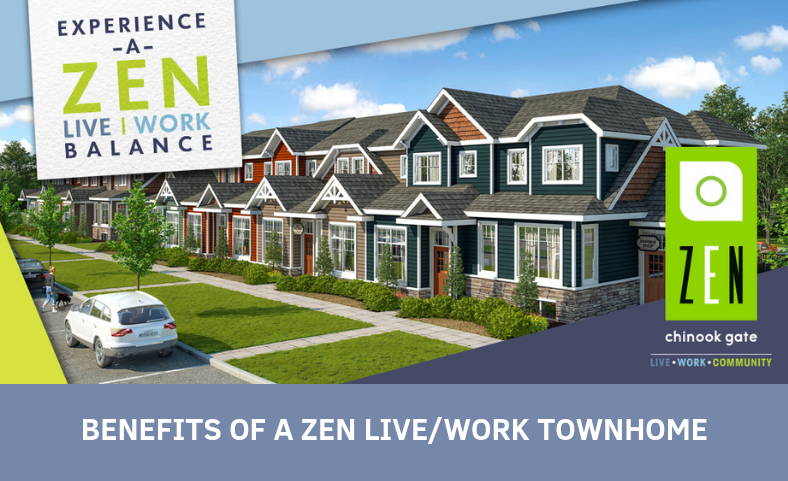 Here are some of the benefits of a ZEN live/work townhome. ZEN townhomes are designed for traditional use or by combining home with office. Whether you operate an insurance agency, a photography studio or an accounting firm, you’ll find ZEN a less taxing way to achieve the balanced existence you crave. Hit the snooze button or use the extra time to be constructive, because there’s no more traffic woes, no more parking wars, all while reducing your carbon footprint. And think of all the money you’ll save, not to mention the wear and tear on your psyche! Working from a dedicated home-based workplace eliminates the cost of renting expensive office space – but your savings are only just beginning. Part of your mortgage and utilities can also be claimed against earnings at tax time – savings that really add up by the end of the year. You’ll find details here. You’ll love your boss – after all it will probably be you! Wear whatever is comfortable because every day is casual Friday. And decorate your space to reflect your tastes and make your environment a creative place for solving issues and getting the job done! Even if you don’t work from home, you can make the designated work area a designated play area for active little minds and bodies. Imagine a space for all the things busy children like to do, painting, reading, games and puzzles – all in one place. Best of all, you don’t need to tidy up, just close the door until the next time! You’ll be in your office within moments of waking up. Your comfortable, warm space offers a more productive setting with less stress and fewer distractions and you can set your schedule to suit your active lifestyle. You’re able to display a business sign and you can have up to 2 non-resident employees working in the space. And finally, you’ll get to brew your coffee just the way you like it! These are some of the benefits of ZEN 2 or 3 bedroom, 2 storey live/work townhomes at Chinook Gate, with 5 floorplans providing up to 1455 sq ft of living space. You’ll find them to be convenient, energy efficient and stylish in a vibrant, close-knit community close to golf, parks, playgrounds, schools, sports and recreation, restaurants, shopping, medical, highways and the airport. Learn more about the next generation of ZEN live/work townhomes here. For more information, contact Matt House at 403-463-6591. Posted in Lifestyle, Live/Work, ZEN By Avalon Master Builder, ZEN Chinook Gate | Tagged in | No Comment.